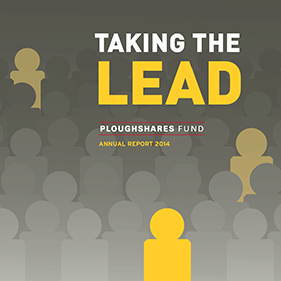 Ploughshares Fund is taking the lead. We are working tirelessly to change the debate on nuclear weapons by creating new conversations, engaging new allies, and investing in the leaders of tomorrow. We are developing fresh ideas and new strategies to broaden the debate and create an awareness that is relatable to everyday Americans.With economic factors influencing a majority of new legislative proposals, the financial crisis presented a new opportunity for Ploughshares Fund to address the nation’s destructive lingering nuclear weapons complex. And thanks to our Iran campaign, Americans know it is worth giving diplomacy a chance to succeed, and Congress knows we are watching. Times are changing. For years, the peace and security field has been fueled by the leaders and ideas that grew out of the mass movements of the eighties. As that generation prepares to hand leadership to the next, there is a demand for new voices and strategies to lead the field in the digital age. Ploughshares Fund is proud to support these voices. And we are proud to take the lead in building a safe, secure world.